Pressure cook thoor dal for 2-3 whistles mash and keep aside. Heat a pan add few drops of oil and fry the okra pieces for 3-4 minutes and keep aside. Heat oil in an available vessel and add all the tempering ingredients one by one ,and allow to splutter . Then add onions and saute till onion get transparent. And add the chopped tomatoes and fry well. Now add the sambar,chilli and coriander powders,stir well and fry lightly. Then add the mashed dal with water stir well and allow to boil . When it starts boiling pour the tamarind juice mix well and again allow to boil for sometime. Then add the fried okra/vendakkai, shredded coconut and mix well. Cook for 2 minutes lastly add some coriander leaves and close the vessel with lid and leave it for sometime. Now the vendakkai sambar is ready to serve. Serve with hot plain rice with ghee on top. Adding sambar powder is optional. 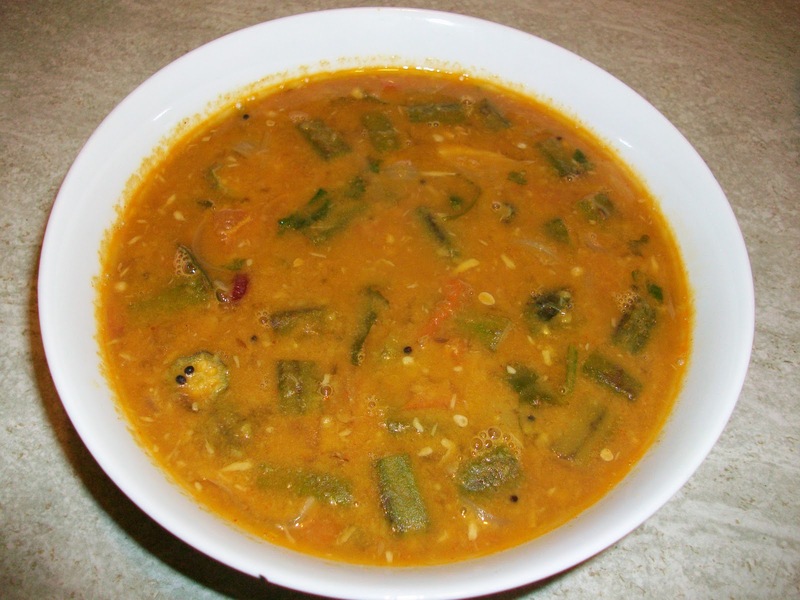 the updated pic Sambar is without sambar powder. After adding okra do not cook sambar for long time.